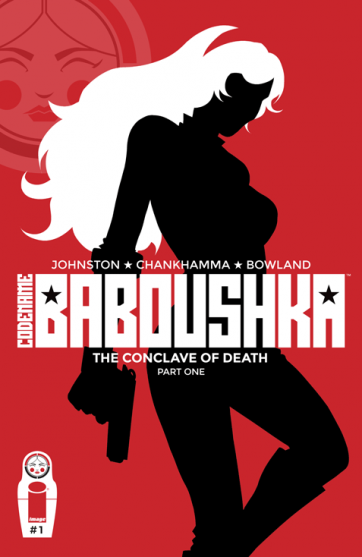 The Fellowship was fortunate enough to obtain a copy of CODENAME BABOUSHKA #1 from Image Comics. Antony Johnston writes, and Shari Chankhamma draws and colors. The lovely Russian contessa is quite the mystery – no one really knows much of anything about her. But mysteries are meant to be solved, and the shadowy government organization has done just that. They have a plan for how to use someone with her unique talents, and can threaten her with extradition to her native Russia, where several crime bosses would love to get hold of her. So she really has very little choice in the matter. Baboushka may be a countess, but she’s also clearly a very effective field operative. This issue certainly lives up to its own Bond references – she handles herself well in this “intro” mission. And she’s quite resourceful, which should make for some interesting situations and stories down the road. The art is intense without being too flashy; the fight scenes especially have a nice feel of Bond-like coldness. This is as exciting a spy thriller as I’ve seen in a long time. And Baboushka is as interesting a lead character as anyone out there right now. This book is mandatory reading. CODENAME BABOUSHKA #1 is available now at your FLCS or at imagecomics.com.